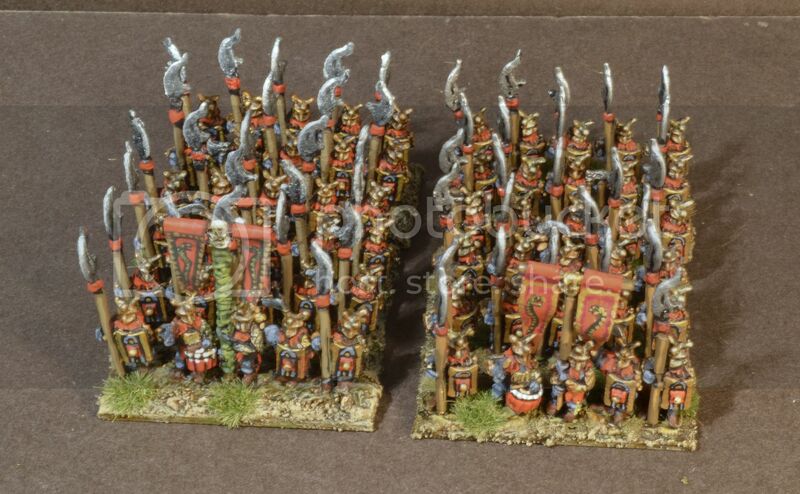 I have long harbored the desire to refight the great battles of Middle Earth with 10mm Warmaster armies. 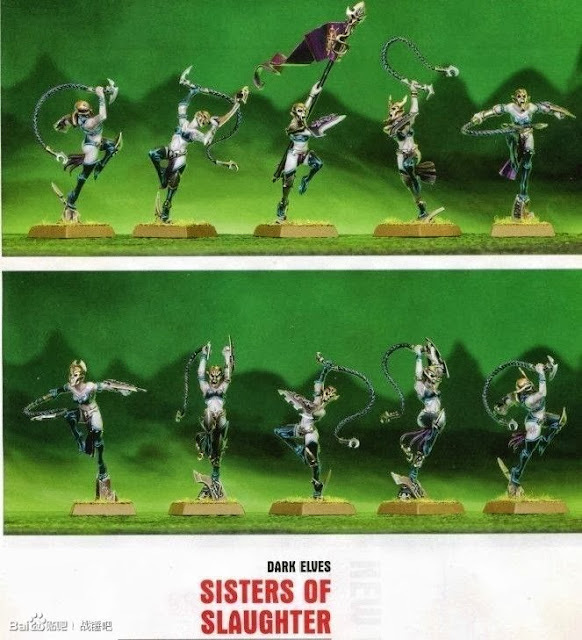 Aside from the problem of needing a large number of regiments for most of the battles, another problem is finding suitable figures to represent the forces present, in particular the Easterlings from Rhûn, which are needed for the battle of the Pelennor Fields. I had hoped that Copplestone would eventually get around to making these, but the line appears to be abandoned. 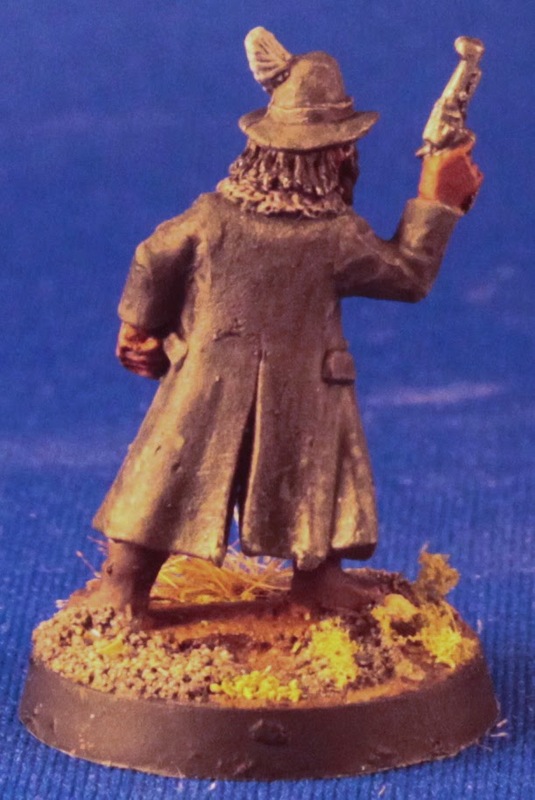 Yesterday I commented on Javier at War's comparison picture of Copplestone warg riders [they are large], and lamented that there are no forthcoming figures from Copplestone to represent the other followers of Sauron. 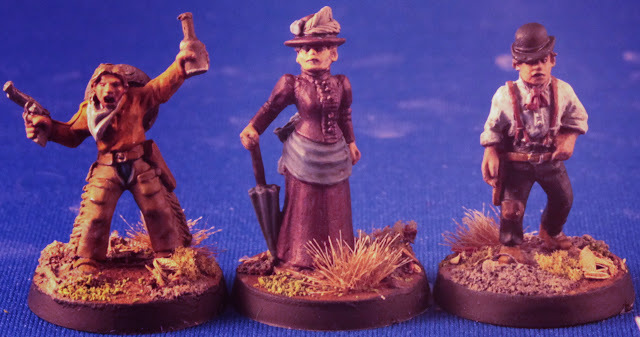 A fellow commenter pointed me to Tajimal miniatures which happens to make a suitable Rhûn Easterling stand in, with a look that is compatible with the movies, without being too ridiculous. So that is pretty exciting, although getting enough regiments to represent the "several thousand" men from Rhûn present at the battle, will not be cheap. 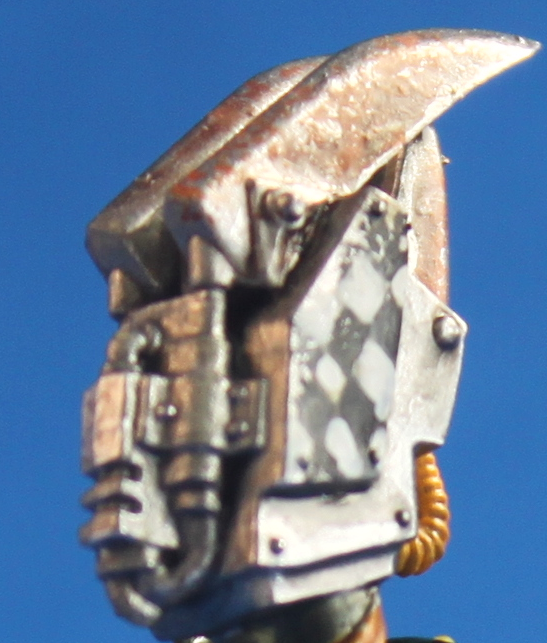 I wanted to show off the weathering on this coat, but unfortunately at four times the size and with the colors slightly off it is hard to see. 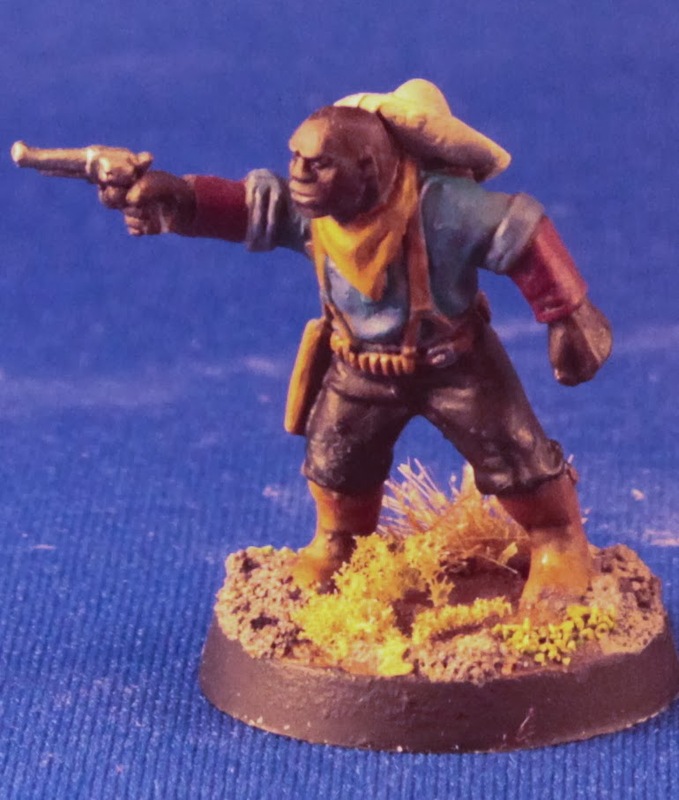 I painted in the ground colors to the duster, to represent ground in dirt and then sponged a bit of a lighter color on top for dried dust. 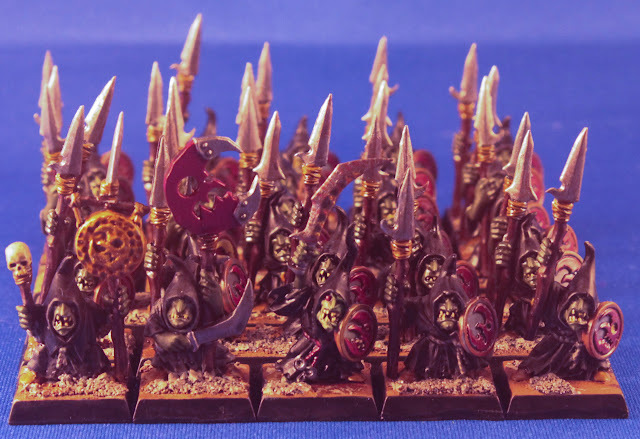 For comparison purposes, here are some prior goblins. The newer ones have much blacker cloaks, and are somewhat sharper. 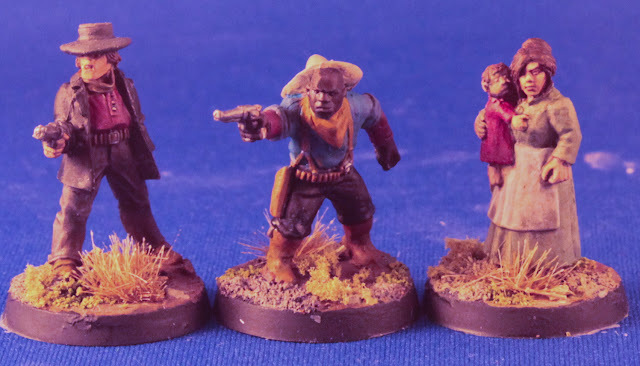 As you can see, the figures still need a matte spray finish, as well as flock and static grass before they are 100% completed, but painting is done, and that is the part that always takes me the most time. 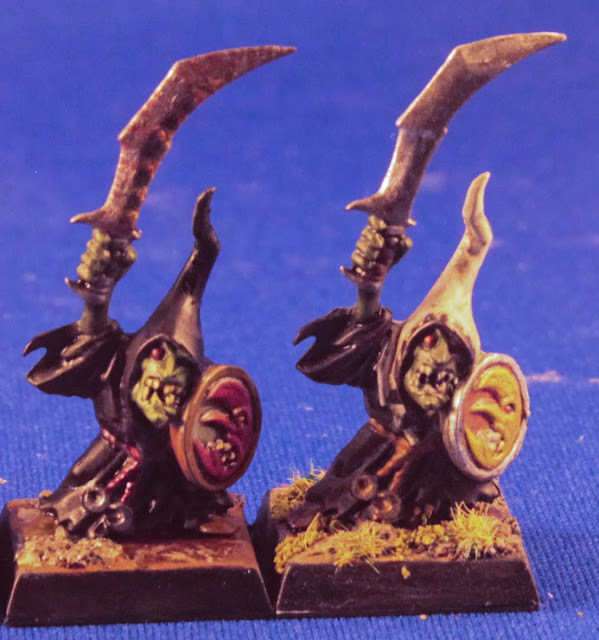 I really enjoy night goblins, which is good, since I have a bunch of fanatics, another regiment of spears, and one of archers as well to build up and paint. After that I have a couple of trolls to convert, and by time I actually get around to all of these, the 9th edition should be here, and hopefully it will have new rescaled plastic standard/forest goblins as well. (and plastic squigs?) So plenty to look forward to in the future. And since Witch elves were never easy to rank up, GW needed to make them more difficult. I would be more excited by the figures, were it not for the very costly rumored prices. WHFB is a great game, but building up armies is getting to be pretty expensive, particularly when a basic regiment costs up to $120. 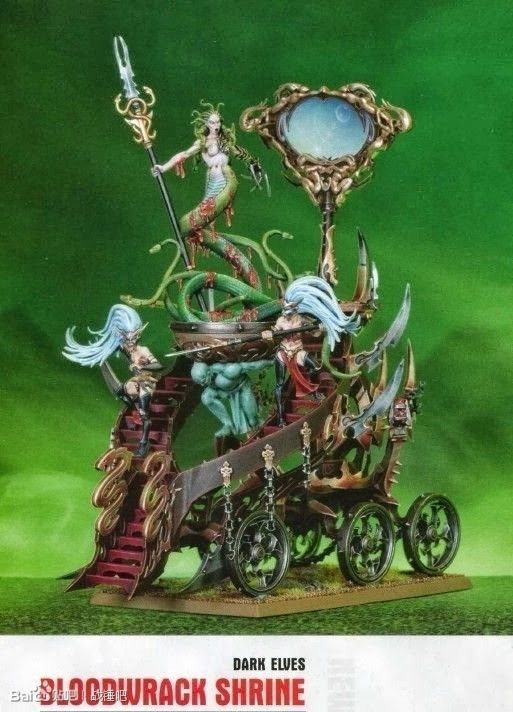 So I probably will not be building a new army (particularly since I already have several in various stages of completeness). This weekend my wife and son were both out of the house for an evening, so in between caring for the baby and taking care of some chores, I was able to break out the lights and the DLSR camera for a short photography session. 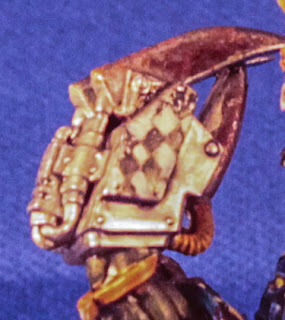 I retook some recent miniature shots with better lighting (350watts of halogen light, and around 200 watts of incandescent light), took pictures of the night goblins that I just finished painting, and then worked on the pictures using Adobe Lightroom on my wife's new computer. Old on the left, new on the right. 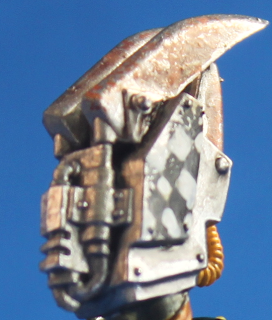 It seems that while the focus is better in the new shot (due to a new method I discovered) the color is better in natural sunlight than with the array of lights, even after correcting in Lightroom. 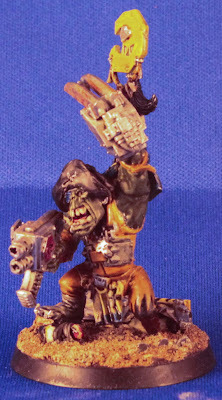 Similarly, the older picture of the Ork is not as focused, but the color is certainly better in the first shot. In this next comparison, we have an old shot taken by OTT light, and the new one with the lighting array and manipulated in Lightroom. Here is the fellow from the Irony, MT bunch, where you can again see the improvement in focus, and here you can also see an improvement in color, although it is still lacking as compared to having the figure in hand. So in conclusion, it seems like the increased focus is beneficial (particularly for closeups) but that getting the correct lighting is important. When I have time, I will endeavour to take some of these shots again with diffused natural light, which we should have plenty of for the next couple of months. What are your thoughts? Do you have any photography tricks to share? A while back, I asked about painting at work. I know that a fair few bloggers do it, either because they have jobs that allow it (such as security guards, or on call work), or because they paint at lunch. I eventually put together something, and began to slog my way though some night goblins. Due to some restructuring, I lost the office shortly after that, and moved into a cube. 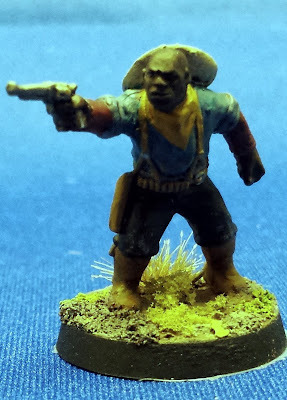 I painted an Ork, and a fair few cowboy types, and recently came back to the goblins. 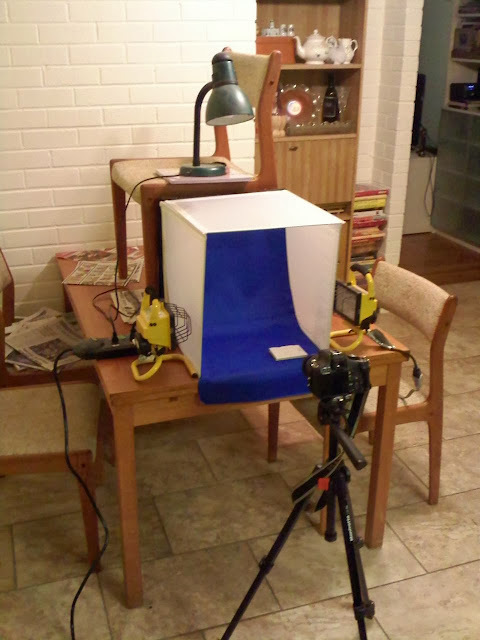 My painting box is made of a cardboard corporate check box salvaged from work, and another smaller box inset into that, which returns some the strength lost from cutting out the front panel. I use a plastic food container for water, and the lid as a pallet. Simple. 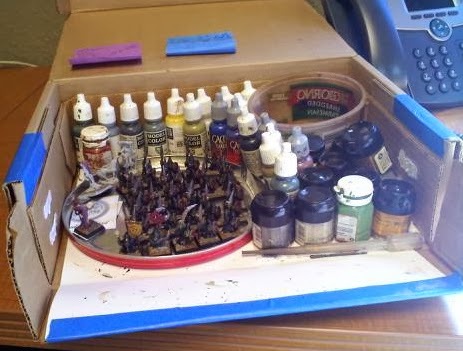 Also seen here are my mix of paints, mostly Citadel of various vintage (mostly old), with the bulk of the rest being Vallejo with a few of the new Reaper paints hiding in the back. Brushes are off camera, but are mostly of the "adequate" rather than the "good" category. A disadvantage of painting at work that I have noticed is that without duplicate paint colors, I can not very well paint both at home and at work without dragging the box back and forth, which is not the easiest, and probably not good for the paint either (since my car gets quite hot should I forget the paint in the trunk). Oh, and after around 5 hours of painting I have a nicely done night goblin unit. (pictures of that to follow eventually) So painting at work? Successful, and something I plan to continue. A nice thing about their models, at least in the 15mm compatible 1/100 models, is that they usually come with more than one vehicle variant on the sprue, so if you only need one Panther A, and three Panther Ds, you can do that with the parts included in the box. 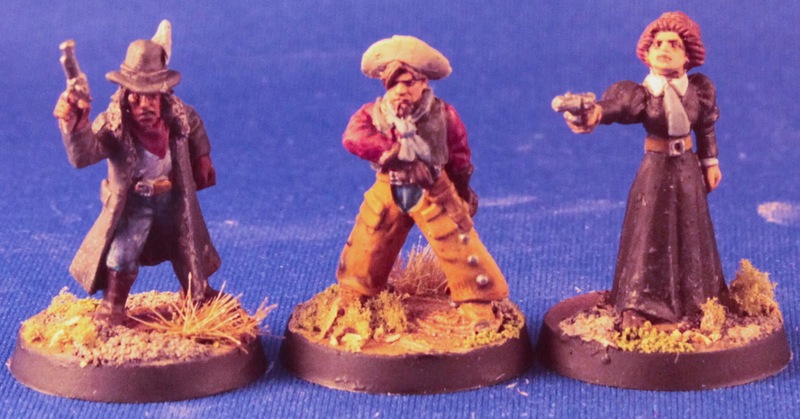 The Wargamer's mind is a fickle thing [and possibly not the most stable]. Far too often when browsing about the Internet, or reading books, or even walking down the street, a new idea springs to mind. Today I stumbled upon an interesting blog through links from other blogs, which I probably reached originally from links in blogs I follow. You know, as one does. In this case it was Matt's Gaming Page, and scrolling down, I noticed a lovely, and well illustrated battle featuring the British and French slugging it out in a company level battle. Wait... company level? Now that is exciting. 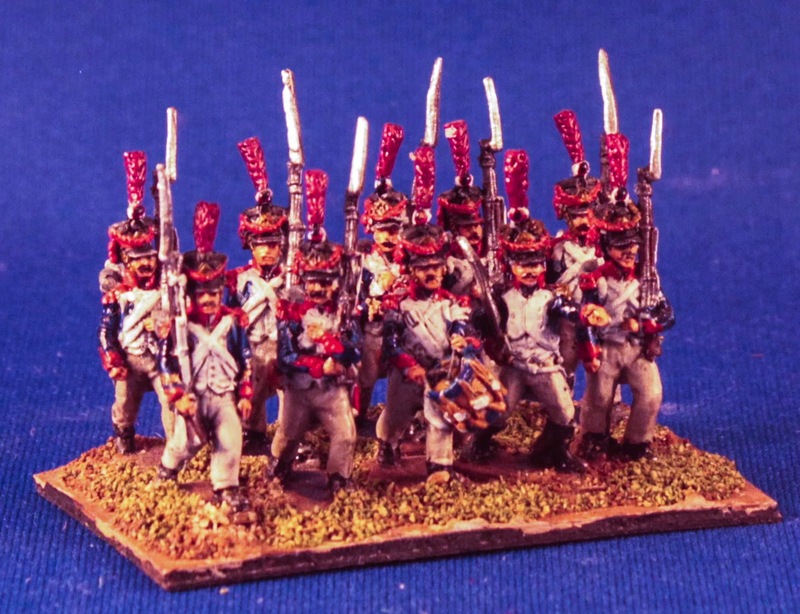 A French company had something on the order of 140 men officially; but in reality it would be somewhat smaller, and if the ordinary privates get left out, you have a more colorful little army of around 50-60 figures. The British and other allies likewise had similar sized companies, and could be reduced in a similar fashion. 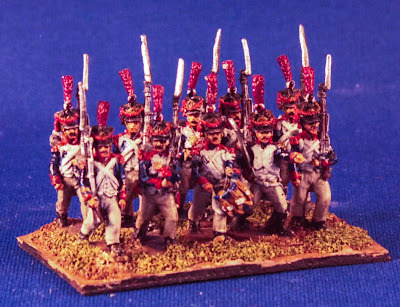 My first inclination would be to look to Perry for the figures, but their own range is aimed at the 1815 period, which can be limiting in some aspects, as the uniforms and equipment changed somewhat through out the wars. 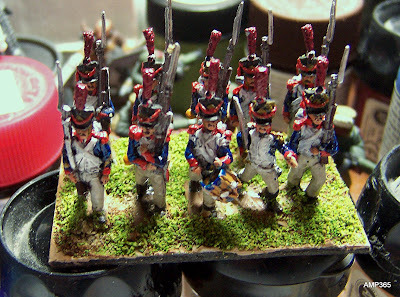 The Perrys also sculpted a large and fairly comprehensive range for Wargames Foundry, and the Eureka French Revolutionary Wars range could also be useful for earlier battles (or for units that did not change uniforms). Victrix too has a large plastic range, which is perhaps more suited to skirmish gaming as well. The Napoleonic period is so colorful, it would be very exciting to paint some larger scale figures [also more difficult], and get some games in. Now I just need more time! There is a movement afoot to collect some like minded friends of mine to play some sort of D&D-ish game online using Roll20. After some back and forth, we may have settled on Pathfinder as our rules of choice, despite it being a new rule set to all of us! Glad I am not the DM for this one. Poking around online, there are some great tools for Pathfinder, which is useful because all the feats and preferred classes and whatnot get pretty complicated for someone like me. 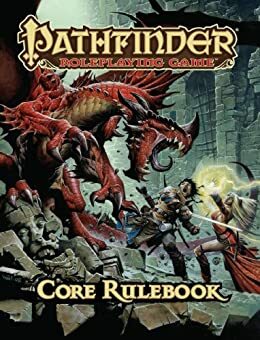 Also, being based on the OGL/SRD material, the Pathfinder rules are available online, which gives you most of what you need to get going [although obviously without all the cool art and flavor text in the real $32 book]. So at some point in the near future, I may be playing a belligerent Elf Oathsworn Paladin... more to follow if it comes to pass.